I think I'm a little offended. 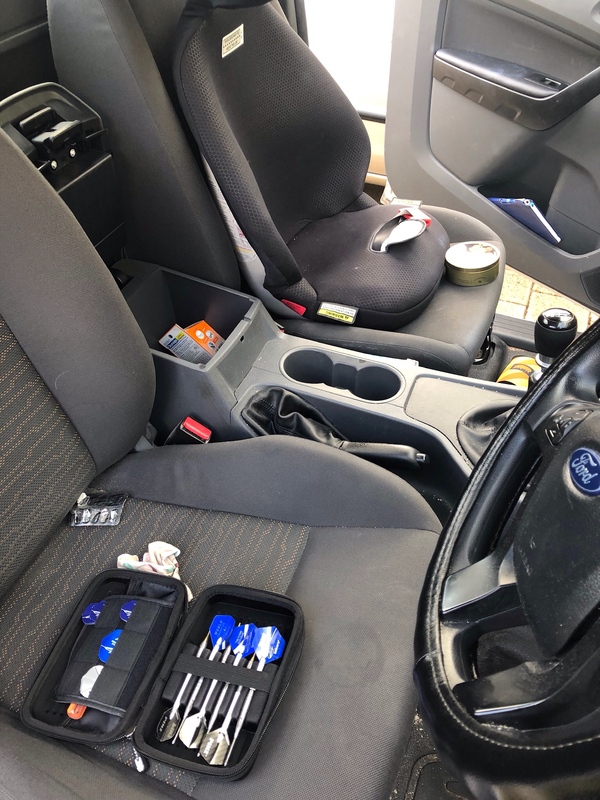 On Tuesday morning I went to go to work, and found my ute had been broken into. I must have left it unlocked taking groceries in the night before. They went through everything, and all I can see that they took was around $4 from my coin tin in the centre console. It could have been a lot worse, that's for sure. The first thing you see looking in is an open Target Takoma XL wallet on the drivers seat, which was also in the centre console. It's got a near new set of Unicorn Phase 5LP, 22g soft tips and a near new set of Unicorn Phase 6 steel tips. They've opened the wallet up... and left it there? How can I not be offended by that!? What, are they not good enough for you? Do you only throw pixels? If you pawned them off you'd make a lot more than the loose change from the coin tin! Honestly, kids these days. I feel like putting a note in the wallet so the next punk knows what they're looking at. Definitely could have been worse though . Bloody right it could have been worse, where I live it would have been gone altogether! Sorry they got into your car - they were most likely just looking for money though, saw the case and opened it and just left it as there wasn't any cash in there. I try to be optimistic, perhaps the thief was a dart player and knew your world would've been crushed so he spared you the hurt. Tough one Dinger, but as mentioned it could of been worse. What the heck? Who'd want your bloody darts with flights like those anyhow? The punks saw that your darts couldn't fly straight and took the cash to buy you new kit. They'll be back. On a brighter note. I think that you are very lucky and a lesson learned never leave the car open. Consider yourself lucky. A friend of mine did the very same thing one night by not locking his vehicle and when he went out the next morning to head to work he failed to see his metal dart case on the front seat. In it were about 4 sets of Taylor darts and a set of Target Elysian darts that he paid about $450 U.S. for just a few months earlier. Plus at least over $100 in stems, flights, gadgets. In all, he lost close to $1000 just in darts and dart related things alone. Oh, and someone played a joke on you and put the steering wheel on the wrong side of your vehicle. Sorry to see this Humdinger. Current time: 04-24-2019, 11:09 AM Powered By MyBB, © 2002-2019 MyBB Group.